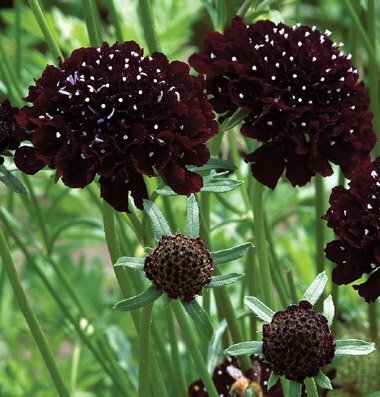 Scabiosa atropurpurea, commonly know as Black Mourning Bride, is a plant native to the Mediterranean. Black Mourning Bride has been cultivated in southern Europe since the year 1629 , and came to the United States during Colonial times and was popular among the Victorian people. This plant grows very quickly and the fragrant flowers work well to attract butterflies, hummingbirds, and bees to your garden. If the flowers are deadheaded during the blooming months, you may be lucky enough to have them bloom again in later summer or fall.If you choose not to deadhead the blooms,allow the seed heads to mature and dry so that you can collect seeds for planting next year. In some areas this plant will return each year as a perennial. In other areas, it may require replanting each year. Scabiosa atropurpurea can be planted from seed directly outdoors as soon as the ground is able to be worked with after winter. Seeds may be started indoors initially about a month before the last frost is expected. In areas without harsh winters, seeds may be planted directly outside in the fall. Space seeds about six to nine inches apart and expect them to reach heights of around 24 to 36 inches. These plants prefer sun to partial shade. Blooming time is from late spring to early summer and mid summer. The blooms of this plant are a deep crimson color that appears almost black. A great summer bloomer for the gothic garden. This plant works well when planted with flowers with deep dark shades of red, maroon, or purple, as well as other black flowers. Some good choices to plant along with Black Mourning Bride are the Black Hollyhock, Black Prince Pansy, and the Sooty Sweet William. Make sure to add some spring blooming plants and some that will continue to bloom into the fall so that you can enjoy your dark, but beautiful, gothic garden all blooming season.